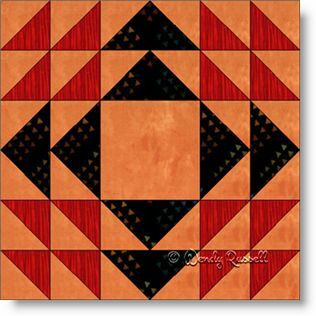 The Homespun quilt block is comprised of three common patches -- the flying geese patch, half square triangles and the square. You might notice that the Homespun block looks familiar. It has similarities to other blocks -- the Cups and Saucers block and the Hands of Friendship block, but on closer inspection you will see the subtle differences. Other than the quilt layouts illustrated here, you might also look to the other two patterns mentioned above for inspiration for other setting designs of your quilt.